Spend your next vacation on the shores of Samaná Bay at this elegant, dog-friendly Dominican escape! You'll enjoy a furnished, oceanfront balcony with spectacular views of the water and resort amenities that include an expansive outdoor pool, tennis courts, a marina, a gym, and a game room! 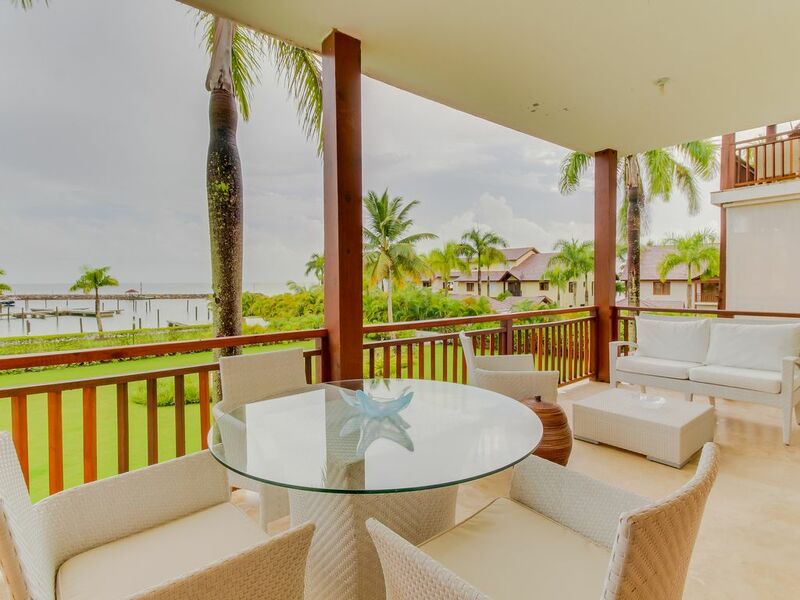 This beautiful apartment sits on the quiet northern shores of Samaná Bay, four miles west of Samaná town. You'll be just a few steps from the Marina Puerto Bahia if you wish to charter a yacht or a fishing boat, and you'll come home each afternoon to an on-site spa (additional fees apply). Some of the country's loveliest beaches are also an easy drive away, including Playa Cayacoa (four miles east), Playa El Valle (10 miles north), and Playa Rincón (18 miles northeast). Parking Notes: You may park in any available space in front of the unit building. Beautiful and spacious and especially clean. Very nice, comfortable unit; fabulous location; fabulous view of ocean and marina. Amazing view, sparkling clean, easy check in and out, fast communication and a great cleaning/cooking lady; what more can anyone ask for. Coming back 100%!! The apartment at The Bannister - Hotel & Yacht Club was absolutely fabulous! The apartment was clean, the club was very well taken care of... The host which I believe was Sebastian took outstanding care of us... He messaged daily to make sure we are comfortable and had everything we need. I was very happy and impressed! Great stay and was as advertised. Great location and views will definitely stay again.